Mount Royal residents are actively engaged in their community and keeping them informed is our top-priority. 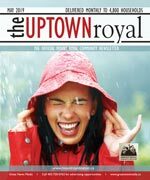 Uptown Royal is the official community newsletter, and covers community news and is published monthly to keep content current and relevant. Delivered to every household, apartment, and business, every resident is acquainted with the community’s most important information. We live in a beautiful community and a team of dedicated volunteer board members are happy to work on your behalf to make Mount Royal a great place to live. We would encourage you to show your support by becoming a member of our community association. Membership offers terrific value for you and your family. In the City of Calgary's 2012 municipal census, Lower Mount Royal had a population of 3,180 living in 2,266 dwellings, a 6.7% increase from its 2011 population of 2,981. With a land area of 0.3 km2 (0.12 sq mi), it had a population density of 10,600/km2 (27,000/sq mi) in 2012. Also in the municipal census, Upper Mount Royal had a population of 2,542 living in 1,071 dwellings, a 0.2% increase from its 2011 population of 2,536. With a land area of 1.3 km2 (0.50 sq mi), it had a population density of 1,960/km2 (5,060/sq mi) in 2012. Residents of Upper Mount Royal had a median household income of $127,135 in 2000, while those in Lower Mount Royal made far less at an average of $35,570. 11.7%% and 26.7% low-income residents live in Upper and Lower Mount Royal respectively. While the majority of buildings in Upper Mount Royal (87.2%) are single-family detached homes, in Lower Mount Royal condominiums and apartment buildings are prevailing at 88.7%, with 77.5% used for renting in 2001. For more detailed info visit the City of Calgary community profiles site.